Drop — An ingredient I need is missing! What do I do? An ingredient I need is missing! What do I do? In other recipe formats, an ingredient name is just a word on a page. 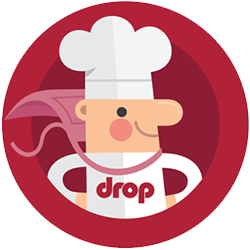 In a Drop recipe, an ingredient name carries a lot of other information with it, so it can be properly weighed, scaled, substituted, etc. Each ingredient has to be stored with its density, unit weight, type, icon, and more. If your ingredient is missing, click on the red question mark icon in the bottom of the screen, and send us a message to request an expansion to the database. This could include a missing ingredient, a tool, a container, or a process that you&apos;d like to use in your recipe, but can&apos;t find in the dropdown list. When we receive your request, we&apos;ll add it to our database with all the requisite information. Once we do this, it will be available to all users. What can I do to maximize battery life?